One of the long-running best-sellers in the Annick Goutal line is Petite Chérie (1998), a girlish fruity-floral that Annick Goutal dedicated to her daughter Camille. Camille has now reciprocated by devoting a fragrance to her mother's memory: it is a spicy floral chypre titled Mon Parfum Chéri par Camille and its composition includes Indonesian patchouli, iris, violet, plum, and heliotropin. Mon Parfum Chéri par Camille is partially inspired by a vintage solid perfume from Annick Goutal's fragrance collection (originally a gift from the author Colette! ); working with the perfumer Isabelle Doyen, Camille Goutal was also "drawn back to her childhood memories of Hollywood's wartime movies. Tempting satin. Delicate lace. Actresses and their gloved hands and ruby lips. And a memory of her mother dressing for an evening out..." For me, Mon Parfum Chéri par Camille succeeds in this evocation. It's old-fashioned, in a full-bodied, self-possessed way, and it really is most appropriate for evening wear (although I normally avoid that kind of fragrance-wearing instruction). When I sniff Mon Parfum Chéri from the sample vial, I notice plenty of patchouli — I don't know what exactly distinguishes Indonesian patchouli from other kinds, but it's there, and it's intense. When I apply the fragrance directly to my skin, its composition turns more complex. The opening has a pinch of dirty spice that reminds me of cumin, although cumin isn't included in the official list of notes. Then there's a long-lasting heart of rooty iris and over-ripe plum, followed by a warm, musky base, and the whole thing is wrapped up with a strong but refined patchouli. If you hate patchouli (which would be a shame, but I'll try to reserve judgement! ), you won't enjoy wearing Mon Parfum Chéri par Camille. But if you love or even like patchouli, particularly when it's complemented by fruity-spicy notes, then you should give this latest Goutal a try. Overall, Mon Parfum Chéri par Camille is a dusky fragrance with an exotic feel, and its purple bottle, ornamented with a black ribbon, suits it well. This perfume does, in fact, seem like something that World War II-era actresses like Rita Hayworth or Hedy Lamarr could have applied before heading out to a nightclub. It's dressed-up, yet assertive. Something about its dark fruity chypre aspect reminds me of classic Femme from Rochas — which, coincidentally, was my own mother's evening-wear fragrance when I was young. (Grain de Musc has also compared Mon Parfum Chéri to Femme, citing the "Prunol" base that appears in both.) If Femme ever had a torrid, passing affair with L'Artisan Parfumeur's Voleur de Roses, this could have been the result. Mon Parfum Chéri has moderate-to-strong sillage and excellent tenacity: on my skin, even the Eau de Toilette lasts through a full day. As you've probably already surmised, it's not a fragrance for the faint of heart. It also happens to smell particularly wonderful in chilly weather. This week, I've enjoyed catching a breath of it when I come indoors and remove my coat, or when it lingers on my deep-brown fur scarf. I'm trying to live up to its gutsy glamour. Annick Goutal Mon Parfum Chéri par Camille is available as Eau de Toilette and Eau de Parfum, in 50 ml and 100 ml sizes. For purchasing information, see the listing for Annick Goutal under Perfume Houses. 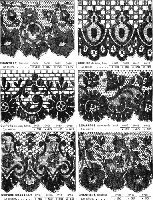 Note: top left image is Grands Magasin du la Samaritaine Saison d'Ete 1886 page 25, via Wikimedia Commons. Annick Goutal was my very first foray into niche (although I seriously doubt the line is considered niche today) and I’ll always have a fondness for the line. There’s just something about the line that’s coherent and really special, in my humble opinion. While patch doesn’t love me, I’ll still give this a sniff the next time I’m at an AG counter. Sayitisntso, that’s so funny: Goutal was one of my early “niche” loves, too. I’ll always be fond of Quel Amour! and Heure Exquise. It *is* such a lovely and consistent line, and it sticks to what it does so well. Ooo, me too! One of my first purchases as I launched into fullblown perfume obsession was Duel – perhaps no woman but me has ever fallen in love with it, but I adore the stuff. I smelled this one at Bergdorf’s and it wasn’t me – it’s a pretty dark Goutal, and though I don’t hate patchouli this isn’t the application I’d have chosen for it. But it’s elegant and well done, and I hope it does well as AG deserves to be known for more than just paler soliflore type scents. Lemon, If I’m remembering correctly, and Duel is the one with the mate’ / black tea note, I can see why you like it! It’s not “me,” but I respected it when I smelled it at the Goutal counter. You are not alone – I love Duel! Strangely enough, my husband does not, so I don’t wear it often. Me too! AG Eau d’Hadrien was my first niche perfume, followed quickly by Heure Exquise and Passion. Still love Heure Exquise…. The EDP of Heure Exquise is particularly delicious! I recommend Goutal often to people who want something more interesting than the typical Sephora offerings but aren’t sure where to start with niche / high-end perfumery. I still love the company for myself, too! My first niche purchase was an Annick Goutal too! Myrrhe Ardente! Love this line too! i also agree that it has something special and i consider it as quite a good bridge between “normal” perfumery brands (chanel, dior….the well known ones) and the “strange” new world of scent that you discover when you first peek into niche perfume houses, which can be a bit overwhelming at first. I find this line quite a good cross between both “worlds” as they are not that strange or uncommon scents but they have something special and different as well as quite good quiality. Love Annick Goutal!! Dhoakohime, you expressed that so well! My experience was similar. Thanks! Easily my favourite release of 2011, and possibly close to becoming one of my favourite Goutals. It’s such a brave and daring fragrance. I just love it, and find it quite soothing in an odd way. Austenfan, We are in agreement! and it was one of my favorites of 2011, too. Is there anywhere to buy this in the US? It looks like it is only available for purchase or ship in Europe. Hm… I have seen it in Bergdorf Goodman in NYC… and I’m assuming that Neiman Marcus also carries it (same owner as Bergdorf)… but now that you mention it, I’m not sure where to order it online in the US. Any suggestions, anyone else? I was just in the Neiman Marcus in the Houston Galleria today, and I don’t think they had this. To be honest, I did not ask, as my nose was really tired by then anyway, but I didn’t see it, and I think it would I think it would be pretty easy to spot considering the color of the bottle. The Bergdorf Goodman website says that it is a “BG exclusive”. Interesting! I always take the “exclusive” label with a grain of salt, but you’re right, it’s not showing up on the Neiman’s website. I always recommend sampling first, of course… but perhaps Bergdorf would take phone orders? I’ll probably be getting a sample of this from TPC pretty soon, as I am interested and it was the only frag on my “to sniff” list for the day that I didn’t get to try. I do like patchouli quite well, and I mean the real thing, not the “clean patchouli” so prevalent today. I got into aromatherapy about 15 years ago and patchouli was one of my favorite essential oils. Maybe it helps that I’m a little too young to have been part of the whole hippie thing in the 60’s and 70’s, so it doesn’t have those associations for me. As I understand it, the EDP is Europe only, and the EDT is available in the US. I see FragranceNet has the EDT online, as does TPC. AS for actual stores, that I don’t know. On FragranceNet, Mom Parfum Cheri par Camille doesn’t come up when you search Annik Goutal. However the EDT is there if you search by it’s name. I think you’re right. This is a good find! Thanks, both of you! I have been meaning to try this and your review makes me want to try it more- it sounds like my kind of perfume! L, I don’t have access to a Nordstrom… so I’m not sure. I’d call first, if you’re planning on going to one! I asked about this a couple of months ago at the Nordstrom in San Francisco, and the SA didn’t seem to think they’d be getting it anytime soon. She seemed just as disappointed as I was. That *is* disappointing… I hope you’ll both be pleasantly surprised! Just popping back to say that Mon Parfum Cheri does seem to be exclusive to Bergdorf Goodman in NYC at this point. I’m sorry! I bet their Fragrance department would do a phone order… in the meantime, hope you can find a way to try it through samples/splits! Beautiful writing Jessica, as always. I find that all AG scents have low sillage and lasting power on me, which is a shame as they are so beautiful. Maybe they are meant to be that way. By the by, this is my first comment on NST, as I have been lurking for years!! Welcome, Paisley Flowers; love your name! Welcome, Paisley Flowers! I hope you’ll be posting again soon. Mon Parfum Cheri lasted longer than most Goutals have lasted on me, but then again, I normally wear the roses and other florals, which are lighter in nature. And thanks for the link, Jessica! Thanks for commenting on the EDP, which I haven’t tried yet; the EDT is quite intense enough for me to wear, especially in the daytime. I do enjoy it, though! I have a question regarding Annick Goutal. What would be the lightest floral that she carries? Thanks. Kris, there are a few light ones… Petite Cherie is a good place to start, and Neroli is a light floral too. Eau de Ciel is a bit more green, but also light. And Eau d’Hadrien is a classic citrus, very refreshing! Out of the soliflores my bet would be Des Lys, from the regular line Petite Chérie or maybe Eau du Ciel. But other people may have different opinions. It’s a wonderful house, and very much worth exploring. I agree with your recommendations! I love me a good chypre and, on paper, this one sounded very promising. Alas, I disliked this one quite a bit. And I don’t mean that it wasn’t my thing, I found it genuinely unpleasant…to put it mildly. It surprised me since I’d mostly read positive reviews before trying it so I can only assume that I’m smelling something very different from what others seem to be. I had a similar experience which Un Matin d’Orage too so there’s that. Abyss, you’re not all alone… I read a few negative reactions on Makeup Alley, for example, so there must be more non-Cheri-lovers out there. Sorry it didn’t work for you! I’d been considering trying this, because so many people seem to love it. But you’ve convinced me NOT to… as a patchophobe (especially if fruit is involved), I think I owe it to myself to not force it. Well… in that case… I hate to say it, but you probably wouldn’t care for this one, then! It’s definitely patchouli-based, and they used a “real” patchouli accord, not that thin, clean, polite patchouli that keeps showing up in mass-market fragrances! Hey Mals – I’m a little late to this party – but I thought I’d respond to you. I love AG – I have about 8 different FB from the line. So I enthusiatically tried this one. I got an 8 ml unsiffed decant. I won’t say it was a big mistake b/c I’d always take a chance on AG. I do however find the edt to be very strident and difficult to wear, nearly unpleasant. It has about 5 minutes of “stuff” and then is 8 hours plus of rough patchouli. Now I like patchouli, but it just comes off very cold and scratchy to me. It never gets “warmed up” or sensual. It’s like wearing a rag wool sweater on bare skin. So that’s that. I don’t see the comparison to Femme, which I don’t care for, but also find to be a much better blended, warm “classic” composition. I’d rather say it’s a weakly executed response to Chanel’s Coromandel than anything. It’s nice that the line includes some winter-appropriate choices (this one, as well as classics like Passion and Heure Exquise), though I always associate AG with spring. Sables is one of my husband’s frags, and every time he wears it I get a craving for pancakes! A sample of this and it smells awful to me. I gave my daughters the others. I just don’t get why this person continues to make perfume. It all smells like dirty water to me. This one mentioned, par Camille lasted about 30 minutes on my skin, thank goodness. Have your Goutal!! Well, that’s that, then! lol. Hey, Jess, if I remember Tom’s talk at the fall Sniffa correctly, you are dead on in your reference to Femme, which was one of Goutal’s perfumes as well. I think. This is how rumors get started, isn’t it? A! Really?! That *is* funny. I wasn’t there, and I got my information on this fragrance from the Goutal website, which doesn’t mention Femme. That initial whiff really did remind me of watching my mother putting on Femme when I was young, and then I was happy to see Grain de Musc mention it as well. Well, it’s definitely not a fragrance for anyone who is leery of patchouli! Sorry! It’s OK, I’m sure I’ll survive :P. I don’t mind patchouli at all but with this one it was all I got. I’m glad that others got more out of it, I just wish I could. Sounds like my cup of tea, I hope it does arrive to Hungary soon so I can test it. Isabelle Doyen was once asked in an interview to name a perfume she wish she’d created. Her answer was ‘Reminiscence Patchouli’. No doubt that this fragrance was part of the inspiration for the new Goutal. A sales assistant told me it’s gonna be discontinued, a year after its release. This seems to be true. AG recently relaunched the range and got rid of all the colored bottles like Ninfeo Mio and Nuit Etoilee (sadly…)replacing them with transparent ones. However Mon Parfum Cheri Par Camille is not up on their website anymore. Must have been a very bad seller if they discontinued it so quickly.